As the lights dimmed and the crowd got even bigger, Cafeta stepped on stage and the musical voyage began with the chords of “Pájaros” from the new album El Objeto Antes Llamado Disco. Rubén, Quique, Meme and Joselo gave us over two hours of musical art with a huge sampling of their vast catalog. “El Baile y el Salón”, “Ingrata” and “La Chica Banda” were among the classics that got us all singing, dancing, moshing and took us away from our ordinary daily routines. 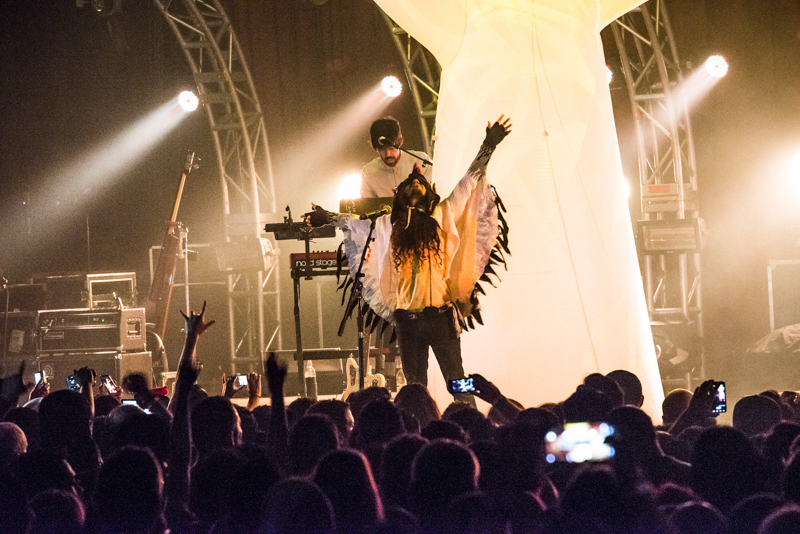 As if in a dream, a white tree appeared on stage along with lead singer Rubén sporting a very regal bird mask and outfit, perfect for interpreting the haunting song “Zopilotes”. The songs that followed paid tribute to Mother Earth with an amazing neuron teasing laser show during “Agua”, at which point it began to rain inside the venue with bubbles of water that mimicked sea foam; truly amazing experience for all the senses! As if this weren’t enough, we also saw a volcano erect on stage and erupt during the song “Volcán”. With elaborate lighting, laser shows and stage props, the guys from Café Tacvba did what few can do. They let the music shine and take center stage while taking us on a musical trip into a parallel universe where music comes to life and we are all united. Of course, no Cafeta show would be complete without “Eres” or “Chilanga Banda”, two songs that were also performed flawlessly and celebrated by all of us that were taking part in this magical, musical voyage. Overall, I’m confident to say that Café Tacvba has been THE best Latin show to ever take place in The Fillmore. Talent, spectacle and passion are the words that best describe the musical universe known as Café Tacvba en vivo.